Twin Palms Resort, A Condominium, has three different types of floor plans to choose from. Two of the floor plans have a mirrored version as well. 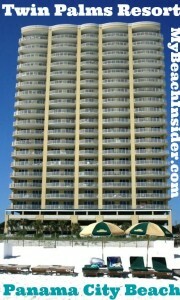 There are 90 residential units in this building with 5 on each of the 18 floors in this Panama City Beach condo. 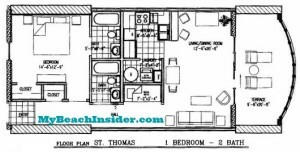 Twin Palms Resort offers only a single one bedroom/two bathroom floor plan. 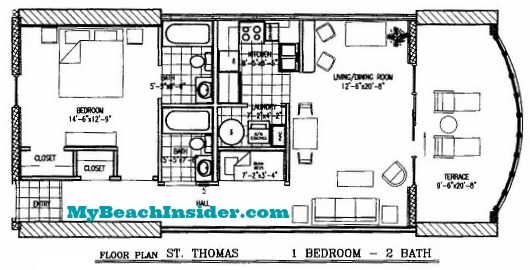 It is called Unit C, or the St. Thomas floor plan. It can be found in the center of the condominium in units that end in 03 and it is 825 square feet. You enter the unit in a hallway. On the left is a closet, followed immediately by the entrance to the master bedroom. This bedroom has a closet and access to a private bathroom with a sink, toilet and shower/tub combo. As you continue in the main hallway, the second bathroom is on your left. It has a sink, toilet and shower/tub combo. Just past the second bathroom, also on your left, is a bunk area. Straight ahead, the unit opens up into the living/dining area. The living/dining area expands to your left. On the south wall is a sliding glass door that leads out onto your beach front balcony. As you walk into the living/dining area, you’ll see the kitchen on your left. It is separated from the living area by a small dining bar. As you look into the kitchen from the living area, you’ll see a laundry/utility room on your left. This area has the HVAC system, a stacked washer/dryer combo and the water heater. 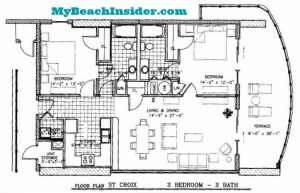 The first two bedroom/two bathroom floor plan in the Twins Palm condo is called Unit A, or the St. Croix floor plan. It is 1,183 square feet and can be found in units that end in 05 on the east end of the building. There is a mirrored version of this floor plan that can be found in units that end in 01 on the west end of the building. As you enter the unit, you’ll find a laundry closet immediately on your right. Just past the laundry closet, there is an entrance to the first bedroom on your left and the kitchen is on your right. The kitchen is separated from the rest of the unit with a dining bar. The first bedroom has a standard closet, a window and access to the first bathroom that is shared with the unit. Just past the bedroom, also on your left, is the entrance to the shared bathroom. This bathroom has a linen closet, one sink, a toilet and a shower/tub combo. Past the kitchen and first bathroom, the layout opens up into the living and dining area. On your left is a closet and straight ahead on the far wall is a sliding glass door that leads out to the balcony. 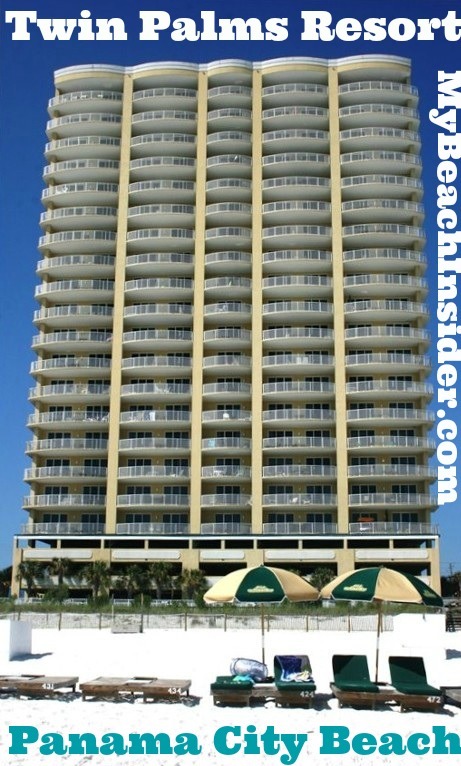 This balcony is one of the larger balconies on the beach from a depth perspective and the entire balcony is 258 sq ft. It also has a small wrap around to the side of the building. On the left wall in the main living area is the entrance to the gulf front master bedroom. The master bedroom has a sliding glass door that leads out onto the balcony, a closet, a linen closet and a private master bathroom. The master bathroom has one sink, a toilet and a shower/tub combo. It also has a closet which houses the HVAC unit and the water heater. Outside the unit, there is a storage closet, but chances are the owners use it for their own personal belongings and you won’t have access to it as a renter. There is an exact mirror copy of this floor plan, the Unit A or St Croix floor plan, on the west end of the building in units that end in 01. 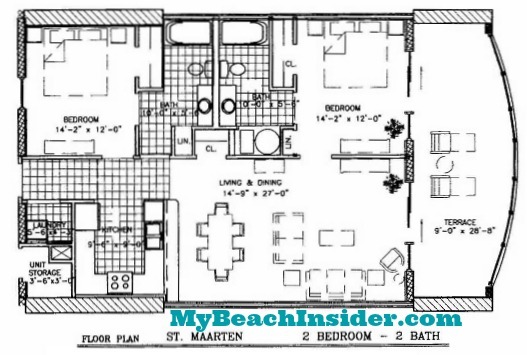 The second two bedroom/two bathroom floor plan is Unit B, or the St. Maarten floor plan. 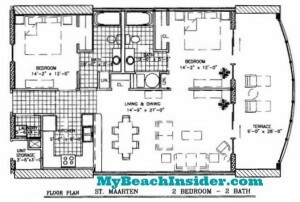 This floor plan is 1147 square feet and can be found in units that end in 02. There is also a mirrored version of this floor plan that can be found in units that end in 04. 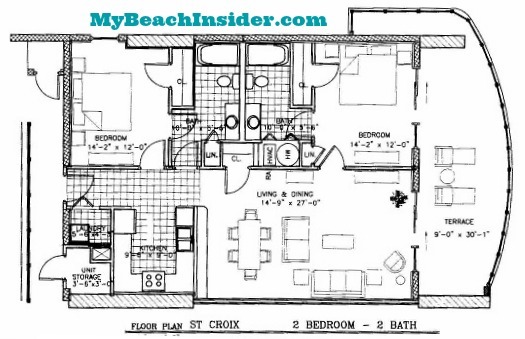 This floor plan is laid out exactly the same as the Unit A St Croix layout, with the following exceptions. The balcony in the Unit B St Maarten layout does not have the small wrap around to the edge of the building which makes sense as this is not an end unit. Other than the difference in the balconies, the St Maarten unit has slightly smaller dimensions. Otherwise, the layouts are virtually identical. There is also a mirrored version of this floor plan which is identical with the same differences, just mirrored. Excited About Your Panama City Beach Vacation? Learn More Now! Here at MyBeachInsider.com, we work hard to bring you information that only locals like myself, (also known as insiders) would know. We share information about the best places to eat, the best things to do and local events that will make your vacation amazing. Make sure to check out the rest of the site!